At first, I was annoyed that last week’s TIAA-CREF BDS hoax was going to take time away from things I wanted to say about the upcoming Presbyterian divestment vote. But then it dawned on me that these two stories were intimately connected. Before explaining how, I wanted to first highlight one important aspect of last week’s TIAA-CREF tale that has gone unmentioned until now. When the BDS “movement” was resurrected in 2009 and began using the strategy of fraudulently claiming institutions were divesting from Israel, one of the big payoffs for them was free media coverage. The Hampshire hoax was their biggest success in this regard in that the story made national news for weeks before the truth finally got out. In fact, I read about Hampshire while vacationing in Montana that year (and started this blog soon thereafter). Once bitten, the mainstream media became a bit shyer about taking BDS press released at face value, which meant that a series of hoaxes related to various financial institutions (such as Blackrock, PGGM and TIAA-CREF) were only covered in some corners of the Jewish press. But these stories mostly provided those of us who write on the subject an opportunity to debunk this new series of fraudulent BDS claims, which meant that even the Jewish press finally got tired of being had by BDSers looking to manipulate both them and the public. This time around, the “TIAA-CREF Divested! No wait! 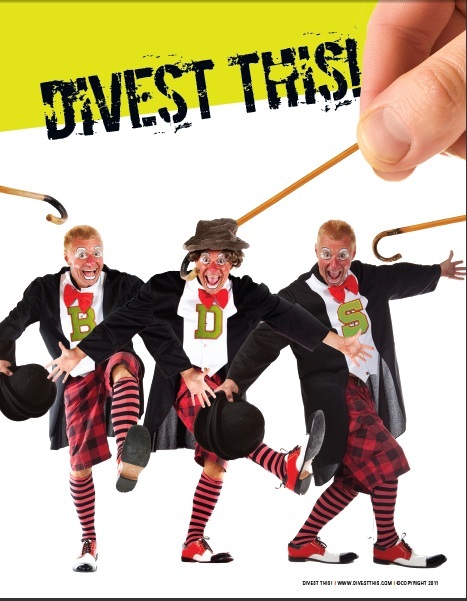 We mean MSCI divested!” story has gotten virtually no coverage outside of blogs and web sites dedicated to promoting or fighting against BDS. The closest they came to genuine media coverage was The Forward which last week published a brief story based on a Jewish Voice for Peace press release, only to take down that original piece and replace it with a more accurate one a day later. In a media age when anyone can be a publisher and mainstream media has been shedding things like fact checking (especially for smaller stories), the currency for getting your story published is a reputation for credibility. And after years of being caught time and time again fraudulently trying to pass off financial decisions by major institutions as politically motivated, the credibility of the BDS brigade (regardless of how much they huff and puff on their own web sites) seems to be shot. Getting back to what the CREF story might say about PCUSA, keep in mind that both of these institutions are not considered enemies of Jewish Voice for Peace and similar BDS organizations but potential allies. As such, you would think the normal way of recruiting people to your cause (such as engaging in conversation, presenting reasonable arguments, and listening to their concerns) might represent good strategies. But think for a moment how TIAA-CREF has been treated by the boycotters over the years. In 2010, the divestment cru sent out press releases declaring that CREF had followed its lead and divested from specific Israel-related assets for political reasons (a lie), which required CREF management to spend time and effort clearing the air by alerting the media and angry investors that the story was a fake. Rather than explain themselves or apologize (or simply avoid the subject of TIAA-CREF altogether out of fear of further embarrassment), instead Jewish Voice for Peace declared that their biggest campaign for 2011 was going to be getting TIAA-CREF to actually do what they just pretended they did the year before. And after more than a year of that campaign going nowhere, last week they reverted back to hoax mode taking a simple indexing measure that required no conscious decisions by TIAA-CREF and using it to declare the academic retirement as all aboard the “Dump Caterpillar” BDS bandwagon (throwing in the fantasy that CREF made these decisions in defiance of JVP’s political enemies for good measure). When I penned this little parody that involved my BDS protagonists torturing the CEO of TIAA-CREF while trying to convince him to do their bidding, I thought nothing could ever come close to my time-wasting fantasy. But the whole Hoax – Campaign – Hoax sequence we’ve seen over the last three years has convinced me that fantasy has got nothing on BDS reality. Now it may be that they can keep up enough momentum from their fraudulent CREF/MSCI story going to convince some of the more credulous Presbyterians already in their camp of precedence for the votes they are being asked to take. But if word gets out regarding not just this most recent BDS fraud but the BDS “movement” history of trying to pass off hoaxes, then that will undermine both of their messages (especially the message that the boycotters should be trusted to tell the truth – either about themselves or about the Middle East in general). And if the Presbyterians start wavering in their support for divestment, we’re likely to see the kind of hostility and misbehavior we saw during the recent Methodist divestment debate (which ended in yet another BDS failure), wrath one would normally see a political organization direct at its political enemies, rather than someone you are feigning friendship towards. 15 Responses to TIAA CREF and PCUSA: BDS Friends or Foes? We are facing a similar issue in Canada with the United Church. And the insight is extremely useful. Thanks. You forgot to mention three of the four 'key factors,' and not to mention the fact that the singular noun “[k]ey factor” (as in no “s” at the end) was in fact never used in the press release, Anon. I'm sure that was just a simple oversight on your part, though. I mean, it's not like those other factors were even included in the very same sentence. Oh wait, yes they were. Serious question – are you guys physically allergic to honesty? Well, I tell my patients with allergies that the best thing is to avoid what you are allergic to. So it seems that the BDS cru is following that advice! But they're really making this so easy– how long did it take you to fact-check that one, Jay? 15 seconds? BTW, how do you like Philly (my hometown)? Yeah, 15 seconds sounds about right. Heh, just a copy-and-paste and then a few seconds of reading. Sad, but all too predictable, that that is all it took. Love it here! I've wanted to live here my entire life (grew up in North Jersey, but spent most of the last decade in Portland, OR with a brief interlude in Oakland, CA), ever since my first visit as a kid, and now that I'm here I'm never leaving. Kensington. Great to be a part of seeing, and helping, this neighborhood come back strong these days. That was actually the title of the article, not something I wrote myself. I didn't know that above all else I would have to lecture you two in English though. So yes, the “on-going controversy associated with use of the company's equipment in the occupied Palestinian territories” was a key factor. It's the equivalent of saying “important element contributing to delisting of Caterpillar from the MSCI was the controversy associated with use of the company's equipment in the OPT. How in any way is that factually incorrect, as Mike suggested? Is this seriously the best you guys can do? Yeah, and Adam Horowitz is a liar, too. And Mondoweiss is one of the most fanatical anti-Israel 'sources' on the internet. Your point? Anyway. When one adds an 's' to 'key factor' Anon, the phrase becomes plural. Which then means that there is not simply one (which would be singular, as you and Horowitz pretended in classic BDS-hoax style) factor, but many, which led to their decision. In fact, four factors. And they were all listed. Not just one, as you and he presented the statement, and tried to pass it off hoping nobody else would read it and catch your disingenuousness. Nor did MSCI state that any one of those factors overrode any other, particularly not the Israel connection. There was no key factor (singular), but rather at least four (note they also said “include,” which means there are possibly other factors beyond those four, as well). Thus concludes your second lesson. Would you like to keep trying, or are you finished embarrassing yourself for now? Please re-read the definition of 'factor' that I have already provided you. The very definition of the word 'factor' implies that there are multiple causes. The title of the article never claimed that the MSCI decision was based on one isolated issue. I don't know how I can make this any clearer, but I'll give it a try. 'Factor' isn't the same as 'direct cause'. 'Factor' is 'factor'. One 'factor' implies multiple 'factors'. That is the DEFINITION that I already gave you. Also, the word 'key' doesn't necessarily mean 'overriding' or 'primary'. One definition for 'key' is 'important'. There can be multiple key factors. Please study the difference between singular and plural, which most of us learn to distinguish by the first grade. Thank you. I agree that BDSer disingenuousness is highly stupid. I'll take your concern very much to heart, anonymous Mondoweiss BDS liar. Serious question – do your legs hurt from backpedaling so furiously? CAT also has franchises–in Gaza and Ramallah. obviously the Palestinians themselves are just fine to be doing business with CAT. I'm sure our anonymous friend has a lie ready to cover that up, too, though. Mondoweiss is on it!